A lightly seasoned chicken breast is wrapped around a savory quinoa filling with melted feta cheese. Perfect with a small spinach salad. **I doubled as this is the drizzle. Bring quinoa and water to a boil in a small saucepan. Reduce to a simmer, cover and cook for 10 minutes. Turn off heat and leave the covered saucepan on the burner for an additional 6 minutes. Remove the lid and fluff with fork. In a small bowl, combine the quinoa, goat (feta) cheese, olives, red pepper, green onion, black pepper and 2 tsp of the oregano. Add the egg and blend well. 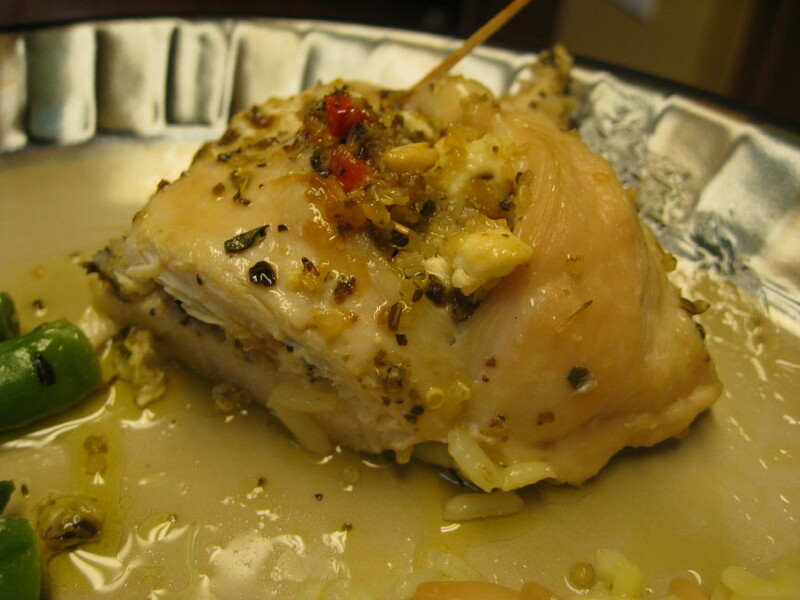 Spoon the mixture onto the center of each chicken breast, roll up and secure with a toothpick. Place the rolled chicken breasts in a 9 by 13 casserole dish. In a separate small bowl, combine the olive oil, lemon juice, salt and remaining oregano. Drizzle mixture over the chicken. Bake on center rack for 20 minutes, (it took 30 for me). Remove from the oven and let the chicken stand for 3 to 4 minutes before serving.